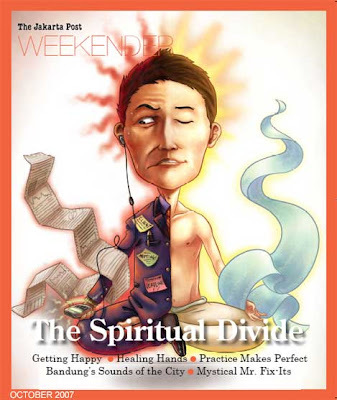 I just love this picture from Jakarta Post's Weekender...the Spiritual Divine. Isn't this how many of our lives are? I know I feel like this most of my waking days. We've all the heard expression, am I coming or going? I stay so busy all the time that I myself can't answer this question. I'm always saying: "Life is too short, have some fun, explore", but am I really doing this myself? I know how important it is to stop and smell the roses, not hold grudges and to learn new things (I really love to learn new things) but how do we find our balance? Our center? Our perfect life synergy? How can I make myself be evenly connected to the world, to individuals, to myself, to work, to earth? Who is my "true" self, what is my purpose, where is my "place"? Ok...I am going a little too deep than most people care to read about SO I'll leave you with this...I have been reflecting on various aspects of my life and I have been reevaluating some things. I am taking baby steps to start my journey in the direction I am wanting to go at this point in my life and my first step has been to de-clutter my life.